The Under 18 Elephant Care and Wildlife Rescue team share their experiences! 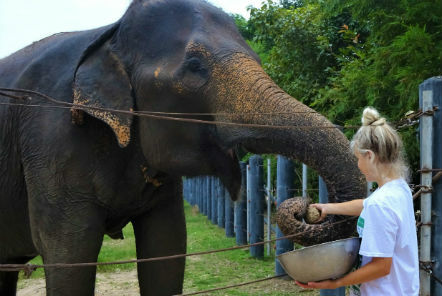 Annually Pod Volunteer organise a trip to Thailand, exclusively for 16 and 17 year olds who are passionate in helping to care for and learn more about the 500+ animals living at the tropical wildlife rescue sanctuary! This summer’s team of 16 volunteers plus their Pod Volunteer Team Leaders, Alex and Lucy, spent 2 weeks putting their love of animals into action and really got stuck into the role, whilst learning more about Thai culture and taking the opportunity to explore local sights. A snapshot of the 2018 team’s experiences! What advice would you give to others who are considering joining this trip? Hannah: “Be ready to work hard and get involved- you are not going for a holiday. To make the most of the opportunity by taking part in everything and allowing yourself to open your eyes to a different culture and way of life." You can read more about previous groups’ experiences here. It is not too late to apply to join next year’s trip. If you are interested in this exciting opportunity, we would love to hear from you! You can learn more about the trip here.